Chickens. For centuries we have oppressed them, grilling, roasting, stewing, and stuffing them in buns. The time has come for us to pay. Intergalactic chickens are invading Earth, seeking revenge for the oppression of their earthly brethren! It's time for you to fight for our ancestral right to omelettes. Will you succeed? Will the future of chicken burgers be secure? Or will you end up as part of the menu in a galactic chicken restaurant? 30 bonuses and 13 medals. 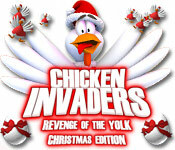 Chicken Invaders 3 Christmas Edition is rated 4.8 out of 5 by 6. Rated 5 out of 5 by SonyaB123 from Eggcellent Game This is a very fun, cute and addictive game. It reminds me of Space Invaders and I loved that game when I was a kid. I would like to point out that the people in the comments above me are mistaken. You should buy this game, you do not start back over on level 1. After you die, you click on "save the world" and then click on "continue mission." You will restart where you died last. I've bought almost all of them. Each one is very fun, I will eventually buy them all! Rated 5 out of 5 by DonnaKK from Chicken Invaders LOLOL!!! I only played for about 10 min. and I still bought it. This was different and not like your usual games. I loved the sense of humor in it. Very challenging and addictive. Looking forward in playing when I have one of those days that I want to blow something up LOL ;). Rated 5 out of 5 by lancsroyal from Fun! As a fan of Space Invaders I had to try this game. Not only does it have a cute storyline but it is addictively fun. The best part is the different sorts of lasers that you can use and knowing which ones work best in which situation is part of the challenge. Plus, you can continue on from the beginning of the last level you were playing after you lose all your lives, rather than starting over from the beginning. 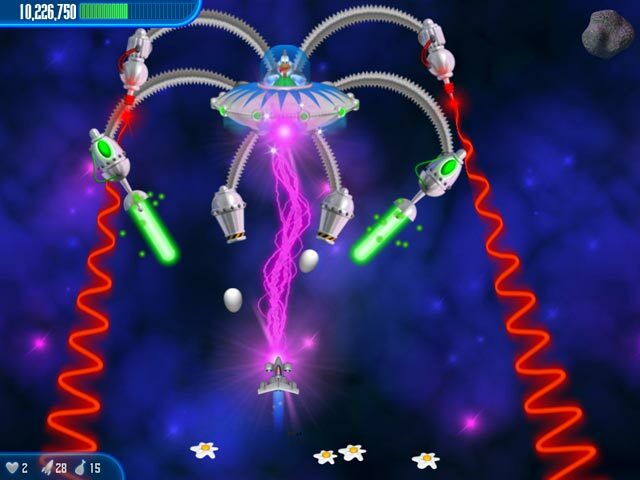 Rated 5 out of 5 by sereneorchid from Love it, but hate starting back at the beginning If you're a sharpshooter with a sense of humor, you'll have a lot of fun with this game. 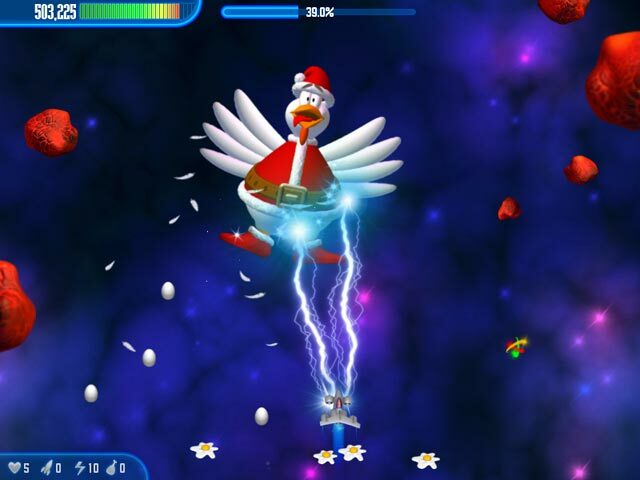 Amusing graphics, sound effects, and a humorous storyline launch the invasion of the Santa-suited chickens from outer space. You are to shoot them down as fast as possible while avoiding dropping eggs, because chickens get nervous, you know. And while you’re busy shooting, you are also trying to collect power-ups, plus falling chicken burgers and chicken legs from the chickens that have been blasted into lunch. 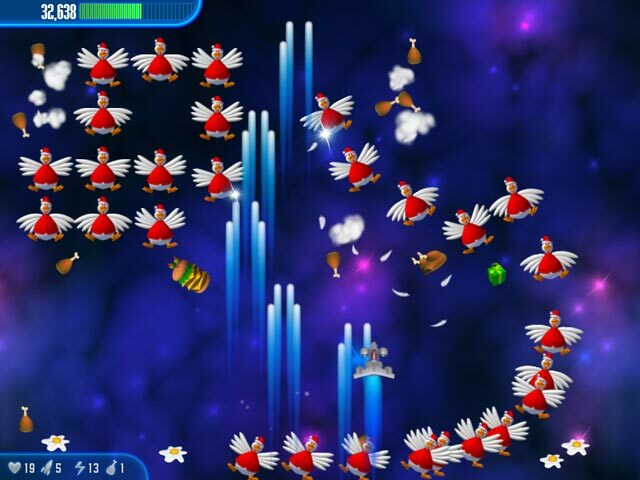 It’s fast-paced and fun, as the Chicken Invaders games are. But when you’ve lost your 5 lives running into an egg, a chicken, an alien, or other space hazard, you have to start back at the beginning of the game. And I’ve only got so much patience for playing the same levels over and over. So while I love ya, Chicken, especially in your Santa suits, I’ll live to fight another day in another game where I can actually get somewhere. Game designers: there should be “safe” levels in the game so that you once you reach them, you return there when you lose your lives, rather than to the very beginning of the game. Intergalactic chickens are invading Earth, seeking revenge for the oppression of their earthly brethren!